Composed by Georges Enescu (1881-1955). Published by International Music Company (IM.916). This is an amazing piece, both for performance and for study. The piano part is insane and is very difficult to line up with the solo part but its not impossible. Enesco Legend is great. great vehicle for tone, expression and dynamic range. The stormy and passionate middle section is a bravura display of technical fireworks, including several types of multiple tongueing, chromatic runs and brilliant arpeggios. Each section is briefly reprised, and the piece ends in quiet serenity as it began. The range extends up to high C (c3), and the piece takes around six minutes to play. The music comes with parts in both C and Bb. 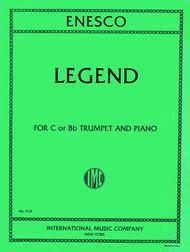 Romanian master Georges Enesco's Legend is a staple in the repertoire of all advanced trumpeters. 84 of 122 people found this review helpful. wonderful music out of my head. Truly a must for any trumpet player. 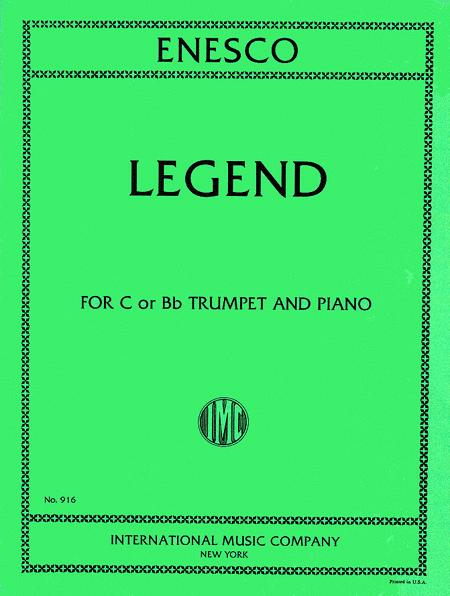 This piece is quite demanding on C Trumpet because of the tendancies of the trumpet =/. Wonderful, awesome, and can never be over-extracted musically. 38 of 80 people found this review helpful. This is an amazing piece of music. From the slow, melodic beginning to the exciting (and rather demanding) fast sections, this solo is a sure favorite. Truly a "legend", if you will. 43 of 82 people found this review helpful.